Unfortunately (yet fortunately!) 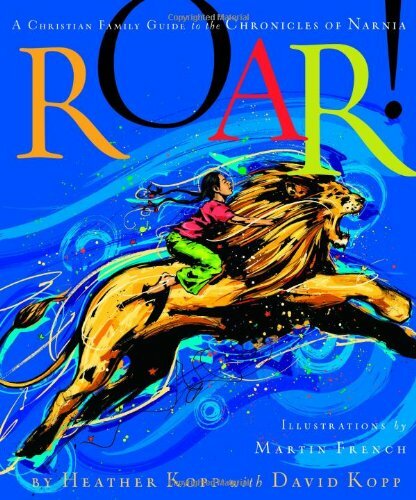 we still aren't of an age around here to begin making good use of Roar! : A Christian Family Guide to the Chronicles of Narnia . (We are very, very close though. I'm thinking next year we'll be there!) However, I do have our copy safely tucked away on our Narnia shelf (now shelves) to pull out in a few years when we can all immerse ourselves in the world of Narnia without reserve. However, I already have great excitement about the book and typically keep an eye out for copies (used and otherwise) to pass along to others. Great is my excitement, yes. I picked up a few (gently used) copies to pass along to some of you during the Chronicles of Narnia Reading Challenge and now it's time to send them off to their new homes. I have TWO copies of Roar! to give away to two of you. Would you like to win? Simply leave a comment below. IF YOU ARE PARTICIPATING IN THE CHALLENGE AND HAVE TOLD ME SO, FEEL FREE TO LEAVE TWO COMMENTS! This contest will be open through Thursday, July 17th and is open to U.S. Residents only. I hope you have some special people in your life to enjoy this book/guide with! Thanks for sending me to Amy's review. I think Derek and I would definitely enjoy this one. I will also be on the lookout for it! And I'm participating in the challenge again! Haven't read the books to my kids yet, very excited to do so. Would love to have this book. Next week we're going over Susan's decisions in Prince Caspian and what the decisions say about humanity. I am loving this reading challenge! I don't know the ages of your children (sounds like they are still young), but if they are into Lego blocks you can encourage them to build scenes from Narnia with Legos. I wrote an entire VBS around Narnia three years ago and one aspect was a Narnia museum the kids could visit. It was filled with Narnian "artifacts" including 20 or so Dioramas or scenes from the books that my children and I created from Legos. We built Uncle Andrew's study, the stone table, the lamp post with Lucy and Tumnus, the Dawn Treader, the Lady of the green Kirtle and a lot more. I'll have to see if I have the photos (lost my external drive). Also, a google search yields some neat Lego creations for Narnia. I would love to read this book. Sounds like fun! I look forward to reading ROAR as I had Lion Witch and the Wardrobe read to me when I was a kid. I would love to win a copy of this book. I have looked at it in the bookstores several times and love it. Would be used with our 2 boys~ thanks! I checked out Amy's review--and, my, but this book sounds great! 'Course, I'm in even less need of it than you are--but that's not to say I couldn't try rounding up some neighbor kids or church kids for some Narnia time, right? I'm participating in the challenge this year--and glad to be! I almost bought this at a used bookstore a couple of years ago but didn't. Since we ARE participating (2/3 of the way through the first book! ), here's my second comment. We have a house of Narnia fans here, all of whom would enjoy this book. Thanks for the opportunity. Please enter me and thanks for the giveaway. I've put it on my list in the event I don't win!